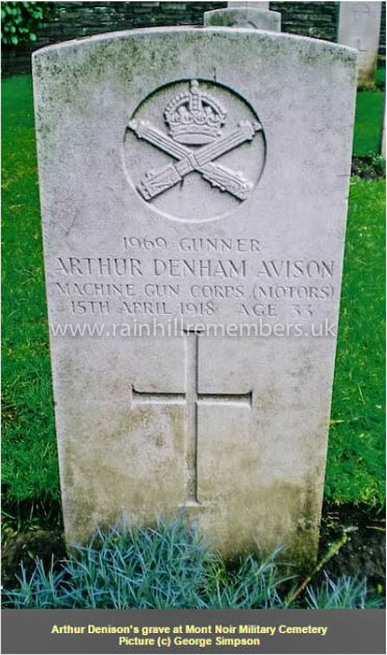 Little is known of Arthur Denham Avison. His name appears on the plaque in St. Ann’s Church, the Memorial in St. Ann's churchyard and the Cenotaph on Warrington Road. Born in Barnsley, the son of William Johnson and Evelyn Margaret Avison, records show that he married Margaret Evelyn Gardner in 1909 and by 1911 was living at 50, Henley Street, Seaforth and had a one year old daughter, Edna. 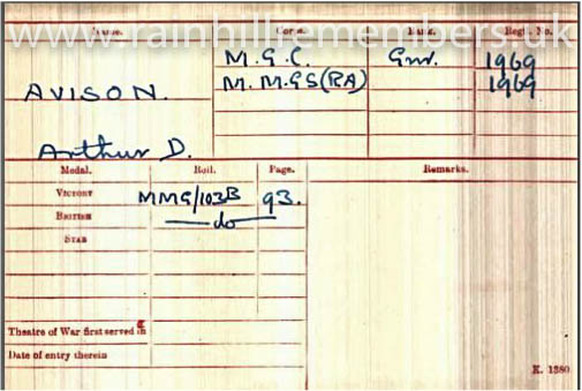 For reasons which are not clear he enlisted in Coventry and joined the 1st Company Machine Gun Corps. Sadly he was killed in action and died on 15th, April 1918, aged 33. At the time of Arthur's death, his wife and daughter were living at 29 Station Road, Prescot. He is buried and has a memorial acknowledgement in Mont Noir Military Cemetery. Medal entitlement: The Victory Medal and The British War Medal. The medal card of Arthur D. Avison showing that he was entitled to the Victory and British War Medal.